I think with the cold weather my computer has decided to be mean. Everything is so slow....ugh. Instead of moaning about it, the kids and I went outside and raked leaves, did laundry (yes it's outside), threw rocks, and did the limbo. Then we came back in and went to work on our "faux" Xmas tree, to be unveiled in a few days. I find myself deep in thought a lot these days, especially with events around me. Mia caught me in a moment, and cupped her hands around my face and said "mommy, have a booboo? ".....these are the moments to treausre forever. It brought me back to n o w.
you're so right. Important to be in the now. 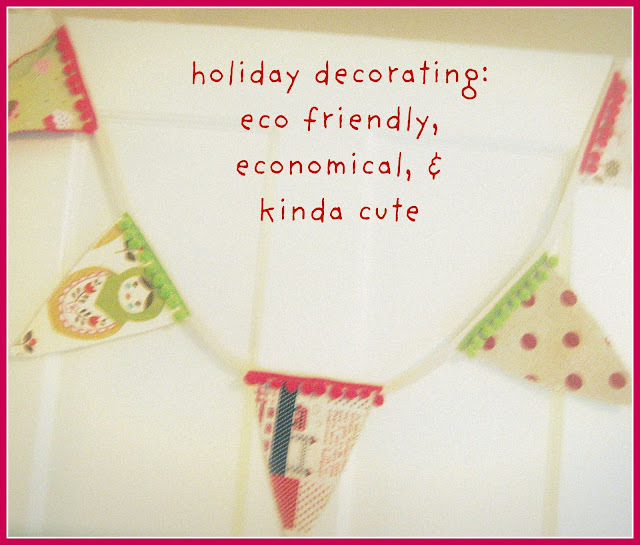 I love your bunting with the pom poms, it makes it just that little bit different. Hey girl it looks like you have been busy! I am peeking out from my blog hibernation! Hope you have a great Thanksgiving Holiday!